I can’t resist this steamed herbal chicken dish. 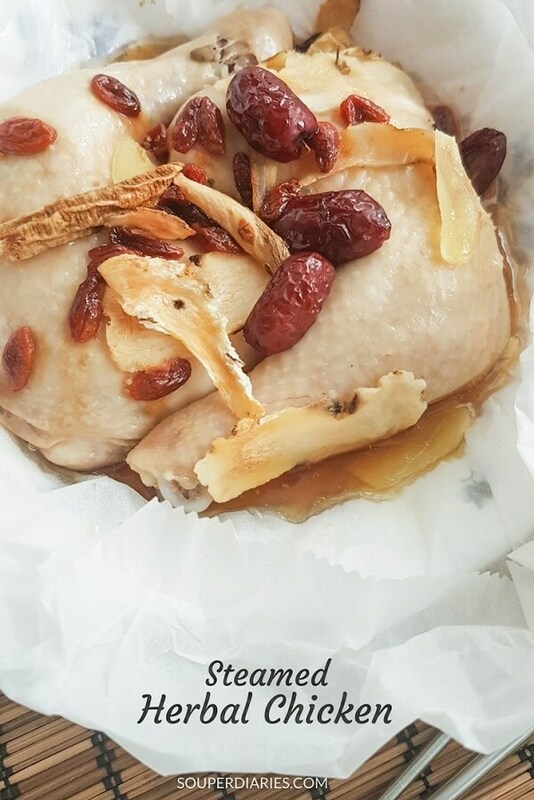 It is a simple but delicious dish of marinated chicken wrapped and steamed with Chinese herbs. The result is tender and moist meat infused with a wonderful herbal aroma. 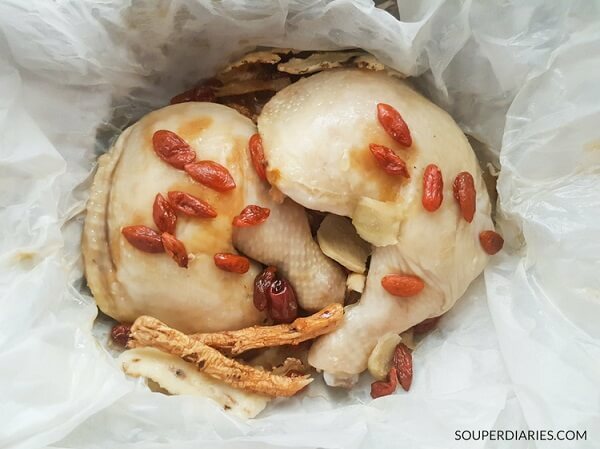 The herbs used for this dish is similar to a Chinese herbal chicken soup. The most dominant herb in this dish is Chinese angelica (more commonly known as dang gui). A warming herb, it has a strong, pungent fragrance (that is not unpleasant) and is also sweet and slightly bitter. Dang gui has many medicinal benefits and without doubt the most well known is its blood nourishing properties. In TCM, it is frequently prescribed to treat a host of women’s ailments such as pre-menstrual syndrome, menstrual cramps, menopausal discomforts, fibroids and blood deficiency. It also counters general weakness and lethargy. Read more about this amazing herb here. 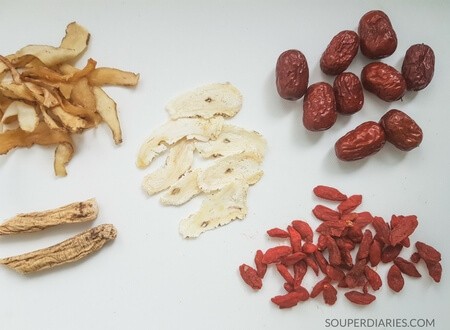 Clockwise from top left: Yu zhu (Soloman’s seal), dang gui (Chinese angelica), hong zao (dried red dates), gei qi (Chinese wolfberry) and dang shen (Codonopsis root). It is really easy to cook this dish especially if you already have all the required herbs. If not, get them from a Chinese herbal shop. For those who often cook with Chinese herbs, it is more economical to get these herbs individually as they can also be used for other dishes. Wrap the chicken with parchment or cooking paper to seal in the juices and herbal aroma and keep the chicken moist. The parchment paper that I cut out for this dish was too big but it did its job. Try to get good quality parchment paper (I bought mine from Phoon Huat) as inferior ones will tear easily. Wrap with 2 layers of parchment paper if it is too thin. If you order this dish when eating out, the chicken will most likely be contained in a cellophane film paper (that resembles plastic) and sealed with aluminium foil. I prefer to wrap with parchment/cooking paper since I’m only using 2 chicken legs and not a whole chicken. Steam the chicken for 45 minutes on medium-high heat. Check on the water occasionally. Add more water if it dries up too much. Delicious and tender chicken wrapped in parchment paper and steamed with Chinese herbs. Remove fats from chicken thighs and rinse. Marinade chicken thighs for at least an hour. Fold the paper over the chicken lengthwise and seal the sides. Alternatively, you can also tie it up into a parcel. 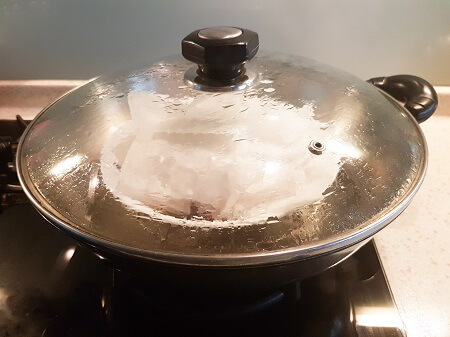 Fill a wok/steamer with enough water to steam. Steam over medium high heat for about 45 minutes. Check occasionally to ensure there is enough water. If the water dries up too much, top up with some water. Serve hot. Is this suitable for kids around 5-9yo to take? I personally would not steam food that is wrapped in aluminium foil. Maybe it’s just me but I’m concerned whether aluminium would leech into the food when exposed to heat. However, I’ve seen people steaming with aluminium foil. I think that parchment paper is safer. Wow Yvonne, what fantastic looking recipes you have here. Some of your soups look absolutely delicious. I have a question Yvonne, could this recipe work if I substituted the chicken thighs for a boneless variety? Thanks. I recommend using chicken with bone-in parts like wings, drums and thighs as they have better texture and flavor compared to chicken breasts. I’m in love with the Steamed Herbal Chicken soup. Being a huge soup lover I’ve decided to save this site and try making everything on it. Thank you for sharing such beautiful recipes. Do you have any soups that could help make people feel full with less calorie count? what do you recommend?